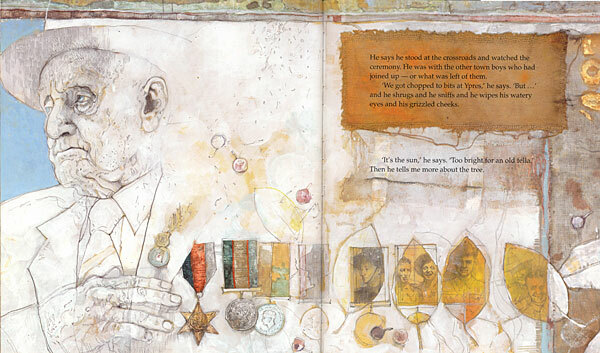 Painting from Shaun Tan’s book, Memorial. I’ve been spending a bit of time lately on Australian author and artist Shaun Tan’s site and finding it very inspiring – he’s very generous with his knowledge and experience. I find it surprisingly reassuring that it is a relatively normal practice to spend time ‘mulling things over in my head’ when I’m working on a creative piece. I bake, I do the ironing, clean the kitchen – I have called it procrasti-baking before, but it all adds up to the same thing: ideas are whirling in my head and I need to be patient and wait for something to pop out. Which it inevitably does. “Most of the few picture books I have done have each taken about a year to complete. Much of that time isn’t necessarily productive in any visible way – true of many creative projects I think. It involves a lot of thinking while doing other stuff (eg. washing dishes) and playing with many ideas that may or may not work, making loads of scribbly notes and doodles in sketchbooks. “With a blank piece of paper in front of me, my imagination is not especially fired up. I could start drawing, but everything would end up looking the same – and most likely stuff I’ve done before. So I actively look to absorb foreign ideas and influences, which is one key lesson learned from years of illustrating different SF stories. Good ideas don’t just turn up, you have to go looking for them. “Research – reading, looking at pictures, playing with different media – provides freedom from the creative paralysis that comes with infinite possibility. I need specific points of reference to develop ideas, and also a kind of resistance to my own stylistic ‘default settings’ so that I think outside the usual circles, and actually learn something new.